Site plan for Merriweather Park at Symphony Woods, as presented to the Howard County Design Advisory Panel on February 26, 2014. The Chrysalis amphitheater is in the lower right. Click for a higher-resolution version. Image © 2014 Inner Arbor Trust; used with permission. tl;dr: I explore the vision for a new park in Symphony Woods and the strategy to implement it. The previous article in this series recounted the history of Symphony Woods up to the fall of 2012. At that time the Columbia Association Board of Directors, at the suggestion of CA staff, decided to re-evaluate its plans for creating a park in Symphony Woods. That process ultimately led to CA’s adopting a new approach, dubbed the Inner Arbor plan, and creating a new organization, the Inner Arbor Trust, to implement that plan. This article describes the vision motivating the plan and the strategy to implement that vision as it was created and refined by Michael McCall, now President and CEO of the Inner Arbor Trust. Meetings of the Columbia Association Board of Directors feature a “Resident Speak Out” period during which Columbia residents and other users of CA services can briefly address the CA board on topics relevant to the Columbia Association. On September 22, 2011, one of the people speaking during the board meeting was Columbia resident Michael McCall. Although it went mostly unremarked at the time, McCall’s appearance at the Columbia Association Board of Directors meeting that night marked the beginning of a major shift on the part of the CA board, a shift that ultimately resulted in CA’s adoption of the Inner Arbor plan, the creation of the Inner Arbor Trust, and the beginnings of Merriweather Park at Symphony Woods. How did Michael McCall come to be involved with Symphony Woods? Originally from Rochester, Minnesota, in 1982 McCall moved to Columbia to join the Enterprise Development Company, the for-profit arm of the Enterprise Foundation (now Enterprise Community Partners), a non-profit organization created by Jim Rouse and his wife Patty in 1981 to help develop affordable housing in the US. After working on several Enterprise Development projects, including a “stealth” joint venture with the Walt Disney Company, in 1992 McCall started Strategic Leisure, Inc., a consulting firm working on development projects in the US and overseas. Although he had lived in Columbia for thirty years, McCall had been relatively uninvolved in Columbia and Columbia Association affairs. As he noted in his Resident Speak Out comments, “I’ve never focused on where I live, because when you’re dealing with the Corps of Engineers in Tennessee [for a project in Pigeon Forge] you just kind of want to relax when you’re home.” Thus the perception of McCall by some that he was an outsider as far as Columbia downtown planning was concerned, not a true heir to the vision that Jim Rouse had for the community. However a more accurate way to put it is that McCall, with his catchy slogans and talk of the “guest experience”, simply represented another aspect of Jim Rouse’s legacy—not just Rouse the earnest liberal reformer concerned with diversity and social justice, but also Rouse the enthusiastic developer who once claimed that “the greatest piece of urban design in the United States today is Disneyland”. Prompted by the Design Advisory Panel’s verdict on the existing plan for Symphony Woods, McCall decided to take a look at the problem himself. After two decades of unsuccessful attempts to enhance Symphony Woods and almost a decade of community in-fighting over downtown Columbia development, McCall brought a different but still Rouse-like perspective on the problem, and circumstances were such that others were willing to consider that perspective and enter into conversations with him about the future of Symphony Woods. The result of those conversations was a concept plan for what McCall called the “Inner Arbor” project—a punning name by which he sought to emphasize that the development of Merriweather-Symphony Woods, together with the simultaneous development of the Crescent property, could have as positive an impact on downtown Columbia as the Inner Harbor festival marketplace and associated developments had on downtown Baltimore.1 The Inner Arbor plan embodied both a vision and (over time) an increasingly more detailed strategy for enhancing Symphony Woods in the context of the overall Merriweather-Symphony Woods neighorhood. A comparison of the Tivoli Garden and Millennium Park sites (outlined in yellow) to the Merriweather-Symphony Woods neighborhood (outlined in red), as presented to the Howard County Design Advisory Panel. Click for a higher-resolution version. Image © 2014 Inner Arbor Trust; used with permission. This is brief and to the point—something recommended for vision statements—and also reflects the community consensus on the future of the Merriweather-Symphony Woods neighborhood that was forged through the Howard County planning and legislative processes. It is the vision that informed the initial Inner Arbor concept plan presented by Michael McCall, and continues to inform the work of the Inner Arbor Trust to create Merriweather Park at Symphony Woods. However this vision statement in and of itself is not as emotionally resonant as it might be. It works well in the context of a planning document, but less well as a vision to excite people. In contrast to Antoine de Saint-Exupéry’s advice on building a ship, it is more about collecting wood and assigning tasks and less about getting people to “long for the endless immensity of the sea”. The Inner Arbor concept plan remedied this lack not by trying to rewrite the “official” Merriweather-Symphony Woods vision statement, but rather by using images and analogies to supplement it and make it more vivid. In particular, one key question addressed in the concept plan presentation is the following: If you wanted to create a “new kind of cultural park” for “arts, cultural, and civic uses”, and you had 45 acres of land to work with (the combined area of Symphony Woods and Merriweather Post Pavilion), what kind of park could you create? … Merriweather-Symphony Woods is loved by Columbia and Howard County residents in the same way that Tivoli Gardens and Millennium Park are loved by residents of Copenhagen and Chicago—the sort of place you might go to meet your friends even if you don’t have definite plans, just because it’s a great place to be. … Merriweather-Symphony Woods is known by people well outside the area—the sort of place where if you’re in town and able to go there you take a selfie of yourself and your friends, because you want other people to know you’ve been there. … Merriweather-Symphony Woods has something–whether one thing or a combination of things–that can’t be found anywhere else. First, realizing the Merriweather-Symphony Woods vision will be a long-term effort. For example, Tivoli Gardens has been the beneficiary of over 170 years of evolution. It shouldn’t take 170 years to fully realize the vision for Merriweather-Symphony Woods, but it certainly will take more than two or three years. Second, realizing this vision will require an intensive design effort. Some people have looked at Symphony Woods simply as an exercise in preservation—that at the extreme it’s simply a matter of not cutting trees down or otherwise disturbing the woods. But the comparison to Tivoli Gardens and Millennium Park implies that preservation of trees, intelligent restoration of the landscape, and sensitively-designed park structures are all needed—Merriweather-Symphony Woods is too small a site, is in too built-up a setting, and supports too intensive a set of uses for a simple “hands off” strategy to work. Finally, realizing the Merriweather-Symphony Woods vision requires looking outside Columbia to find the best and most appropriate design talents for the task at hand, wherever in the world they might be found. Is this a realistic vision? The answer implied by the Inner Arbor concept plan presentation is yes, given a reasonable amount of time, money, and design talent. As Michael McCall noted in his Resident Speak Out comments, the key is to have the right strategy. Inner Arbor concept plan, “concerto in three parks”. Click for a higher-resolution version. Image © 2013 Inner Arbor Trust; used with permission. In the case of Symphony Woods there was a vision, along with proposed tactics (pathways, a fountain, a café), but no clear strategy. As McCall wrote in the same column concerning the “math of success”, “Lacking Strategy + Good Execution = Disappointment.” In the case of Symphony Woods the key to creating a good strategy was to not focus on just the section of Symphony Woods covered by the then-current Columbia Association plan, but rather to go up a level and consider the entire Merriweather-Symphony Woods neighborhood—the “whole park”, as McCall put it in his Resident Speak Out remarks, the “whole thing”. The northern section of Symphony Woods, the 16-acre area covered by the Columbia Association’s previously-submitted Final Development Plan, is to be the “public park”. This is in line with people’s traditional conception of Symphony Woods: It is the part of Symphony Woods most familiar to Columbia and Howard County residents (including as the site of the Wine in the Woods festival), the part previously threatened by the intensive development contemplated in the original GGP draft downtown plan, and the part that the Columbia Association was already focusing on prior to the creation of the Inner Arbor plan. The combination of Merriweather Post Pavilion and a relatively open adjacent area in the eastern part of Symphony Woods is to be the “performance park”. This combined area forms a natural east-west axis south of the public park, with the Symphony Woods portion having been previously considered as the site for a new Columbia Association headquarters, and is potentially suitable for other “arts, cultural and civic uses”. Finally, the southern portion of Symphony Woods, just north of the Crescent property, is to be the “curated park”, with a focus on public art. Due to poor public access that area has been even more neglected and unused than the northern section of Symphony Woods. However with the planned build-out of the Crescent property the southern section of Symphony Woods will assume more importance, and arguably will one day be as prominent a gateway into the Merriweather-Symphony Woods neighborhood as the northern section. It also has a small pond to provide a focal point for the area and a backdrop for art works. 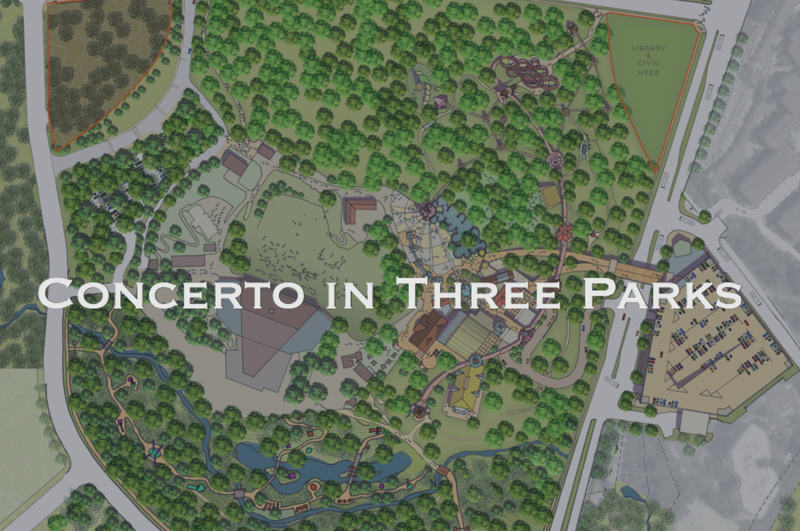 The Inner Arbor concept plan also contains a number of suggested ways to realize the “concerto in three parks” strategy: In the performance park, an “arts village” hosting new indoor theatrical venues to replace the existing Toby’s Dinner Theatre facility. In the curated park, a sculpture garden with “organic art” to complement the natural landscape. In the public park, an “iconic sculpture” and a “treeline” boardwalk to connect to the performance park. And finally, a bridge to tie Merriweather Post Pavilion and the arts village to a parking structure and transit facility suggested for outside of Symphony Woods on the current Toby’s Dinner Theatre site. “Operational elasticity” and “beyond the berm” strategy as embodied in the proposed boundary area between Merriweather Post Pavilion and Symphony Woods in the Inner Arbor plan. Click for a higher-resolution version. Image © 2014 Inner Arbor Trust; used with permission. The original Inner Arbor concept plan did not suggest any structures for the section of Symphony Woods just north of Merriweather Post Pavilion and just south of Little Patuxent Parkway. That area was already the subject of Columbia Association planning efforts for Symphony Woods Park, and there was already a set of proposed park features submitted as part of the Final Development Plan previously approved by the Howard County Planning Board. However the Planning Board had called for key changes to the FDP, including in particular rerouting paths to avoid trees and pursuing a closer integration of the park with Merriweather Post Pavilion. First, this was the aspect of Symphony Woods development that was furthest along. The Howard County planning process for downtown Columbia requires a total of 16 steps: eight steps for a Final Development Plan, and a further eight steps for a Site Development Plan. 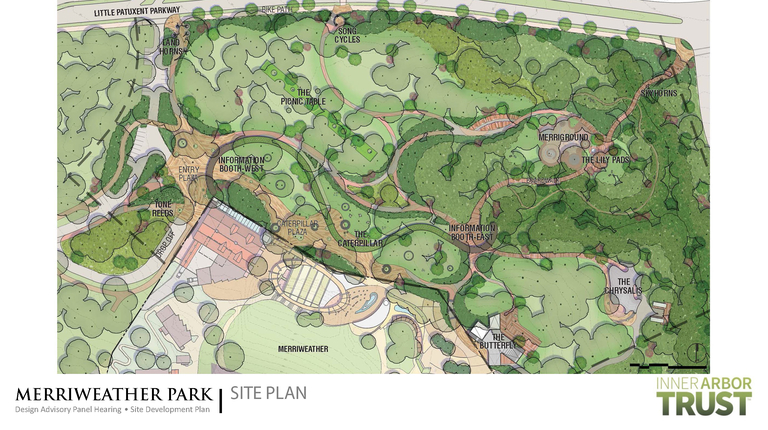 As noted in the final slides of the public presentations of the Inner Arbor concept plan, development of the northern public park section of Symphony Woods was already at step 9, having completed FDP review, while development of the performance park and curated park in the eastern and southern sections was at step 1. Second, given the concurrent planning for the renovation of Merriweather Post Pavilion, developing a plan for integration of the pavilion property with the northern section of Symphony Woods was a high priority. Finally, development of the performance park and curated park was and is conditional on the pace of development of the Crescent property surrounding Symphony Woods to the south and east: Public use of the performance park and associated arts village envisioned in the Inner Arbor concept plan assumes implementation of new facilities for public parking outside of Symphony Woods, while public use of the curated park assumes conversion of the existing private Symphony Woods Road south of Symphony Woods into a public street. Both of these developments will take some time to come to fruition. Given these factors, Michael McCall’s chosen next task was to create an improved strategy for the “public park” aspect of the Inner Arbor concept plan, building on the previously-approved Final Development Plan together with the associated recommendations by the Planning Board for meandering paths and integration with Merriweather Post Pavilion. First, the Merriweather Post Pavilion property would be treated as an extension of the public park, and be opened to visitors year-round during times when the pavilion did not host ticketed events. In return access control for Merriweather Post Pavilion would be provided by a new boundary feature located in Symphony Woods proper, replacing the current fence at the property line on the north side of the pavilion site. The general public would then be allowed access to the portion of Symphony Woods north of this new boundary even during Merriweather Post Pavilion events. In comparison to integration with Merriweather Post Pavilion, incorporating the “meandering paths” recommendation into the strategy seemed relatively straightforward. At the highest level it mainly required abandoning the relatively rigid cruciform arrangements of paths specified in the Final Development Plan and moving to a curved pathway system that respected the existing trees and the topography in which they were situated. However in practice this aspect of the public park required significant thought as well, in particular to address the “industrial engineering” aspects discussed by Michael McCall in his original Resident Speak Out comments: Would the pathway system adequately handle circulation for the largest events at Merriweather Post Pavilion, as well as events like Wine in the Woods? How would the pathway system function to draw people into the public park? What park features would be most effective in attracting visitors, and how would the pathways most effectively direct people to those features? Key features of the Inner Arbor plan for the public park aspect of the Inner Arbor concept plan for Merriweather-Symphony Woods, showing relocation of those features from the locations in the Final Development Plan. Click for a higher-resolution version. Image created by Frank Hecker based on Google Maps satellite imagery, sheet 3 of FDP-DC-MSW-1, “Downtown Columbia Merriweather-Symphony Woods Neighborhood Final Development Plan”, and slides 25-33 of the Inner Arbor Trust presentation to the Design Advisory Panel. As it evolved the Inner Arbor plan for the public park reflected the answers to those questions, answers embodied in the various tactics by which the new park strategy was to be implemented. Michael McCall’s approach was to take the list of previously proposed “tactics”, i.e., the park features outlined in the approved Final Development Plan, and enlist each of them in the service of this new strategy. 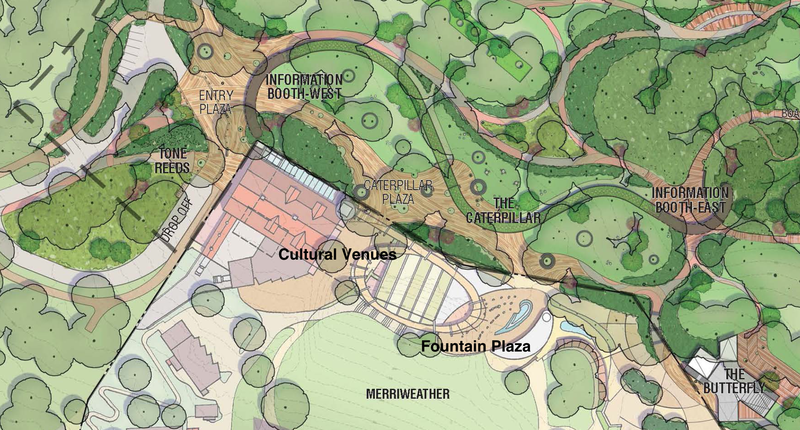 As noted above, the fountain called out in the Final Development plan as being located in Symphony Woods was instead proposed to be relocated on the Merriweather Post Pavilion site as part of the transition area between the pavilion site and the Symphony Woods property. A new feature not specifically called out in the Final Development Plan was the Caterpillar “green berm” stretching east to west just north of Merriweather Post Pavilion. The Caterpillar’s primary function is to provide access control from the northern section of Symphony Woods into the transition area bordering Merriweather Post Pavilion. It serves in place of a traditional fence, like the one presently separating Merriweather Post Pavilion from Symphony Woods, and makes for a much more visually attractive barrier—the “art of bounds”, as McCall put it. The children’s activity area, now named the Merriground, was originally proposed to be right next to the Merriweather VIP parking lot. It was moved to a more scenic location further north in the woods. 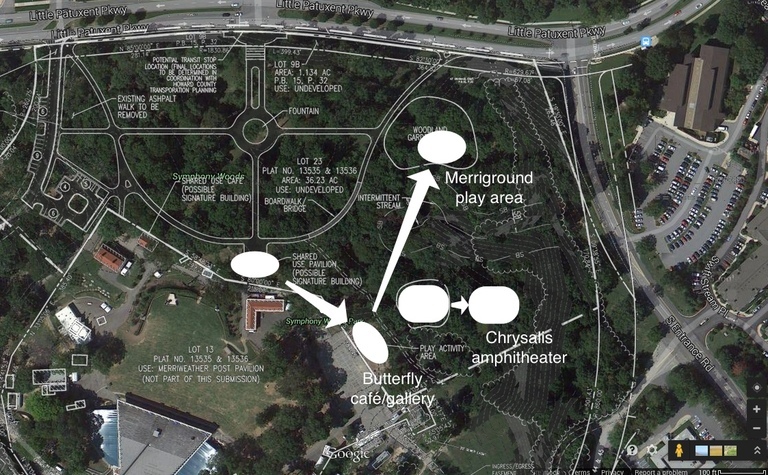 The shared use café, the Butterfly in the Inner Arbor plan, was then moved to the activity area’s former location next to the Merriweather VIP parking lot, near the east entrance of Merriweather Post Pavilion, so that its shared use with Merriweather Post Pavilion would be more convenient. Finally, the proposed shared use amphitheater, what is now to be the Chrysalis, was moved slightly to the east. This took it down a hill somewhat compared to the location in the FDP, providing more space for the audience and more separation from Merriweather Post Pavilion. The Final Development Plan also referenced public art in the park. That function is fulfilled in the Inner Arbor plan by the Merriweather Horns sound sculptures, which replaced other art features proposed in an earlier iteration of the Inner Arbor plan. The Inner Arbor plan has thus evolved from the earliest concept plan to the latest site development plan for the northern section. The concept plan of late 2012 and early 2013 provided an overall framework for developing the whole of Symphony Woods as a component of the Merriweather-Symphony Woods neighborhood, the more detailed plan of late 2013 provided a framework for developing the public park component of Merriweather-Symphony Woods, and the revised plan of early 2014 locked down the detailed site design that now drives the development of Merriweather Park at Symphony Woods. The next article in this series will look at the processes and institutions by which and through which the vision and strategy discussed in this article are being realized in the current construction of the Chrysalis amphitheater.